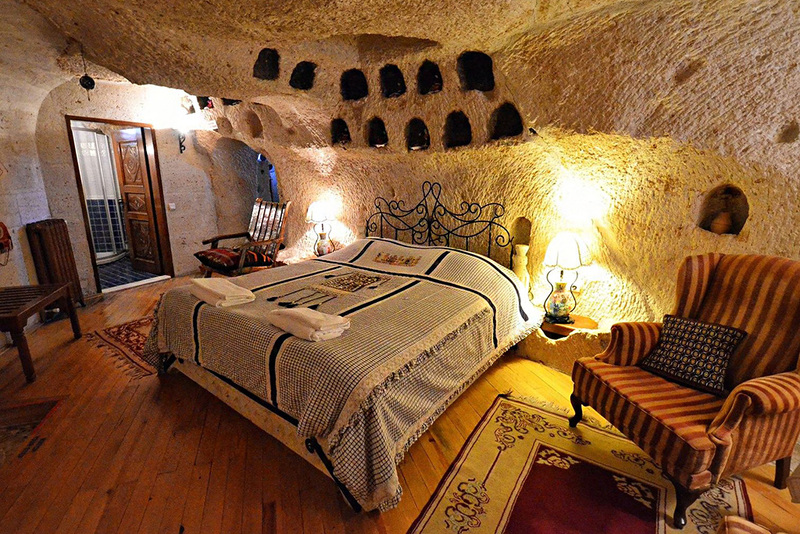 You are here: Home » Spend A Night In The Comfort Of Your Own Cave – At Cappadocia Cave Suites, Turkey! Cappadocia is an otherworldly region in central Turkey, and probably the country’s most fascinating geological feature. 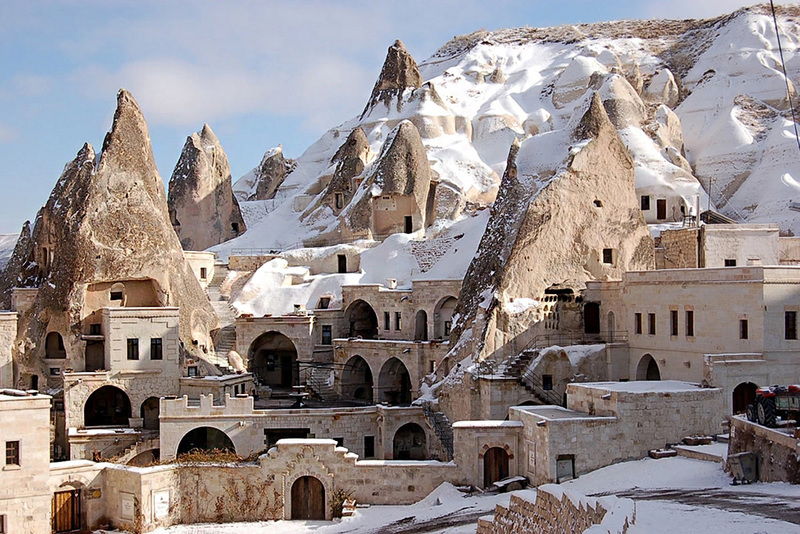 Said to have emerged from molten lava that cold down over millions of years ago, Cappadocia is a land of weird topography, with its “fairy chimneys” being the most prolific of its features. The region seems like a land lost in time, with ancient ruins of the past and modern touches of the present. But among the rocky terrain and the chimneys, are hidden some of the most historic caves in the world. 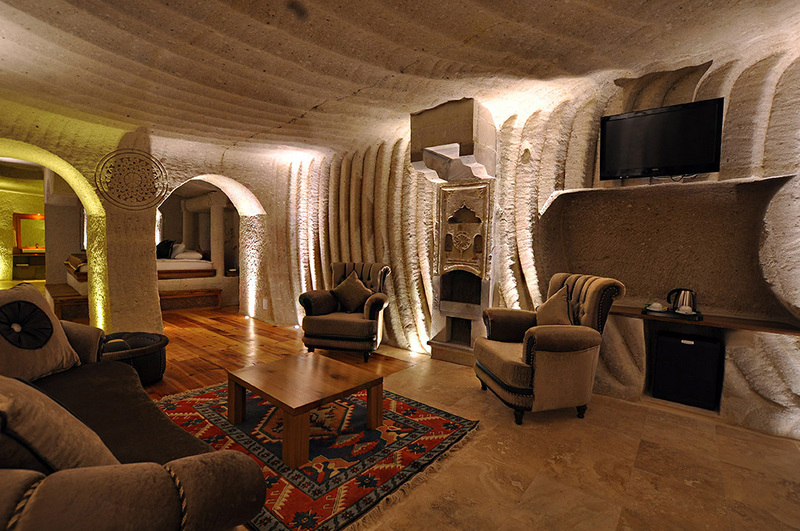 Centrally located in the heart of the city of Goreme, Cappadocia Cave Suites is a truly unique structure that combines cave & hotel by offering accommodations in the original cave dwellings of the Byzantine, Hittite, and Roman eras, fitted with all the modern luxuries of the 21st Century. This cave hotel is located smack in the center of one of Turkey’s most picturesque locales, highlighted by Cappadocia’s unearthly topography. Cappadocia Cave Suites is the perfect place for a romantic couple’s holiday, or even an annual family vacation. Cappadocia and the hotel itself reek of opulence and nostalgia, giving guests the perfect opportunity to unwind with a host of activities and some of the finest food in the country. Another notable feature about Cappadocia hotel is its location, close enough to the wide number of attractions and the city center, yet removed enough to avoid the tourist crowd. Cappadocia aims to offer guests a local experience that allows them to blend with the residents of the village. The area around the hotel is a blast from the past, lined with barber shops and cafes, and where horse-drawn carriages can still be seen clacking down the roads. The hotel is routinely featured on a number of travel websites and international travel magazines. This odd location was also the pilot episode for the Travel Channel’s “Bizarre Worlds” show. 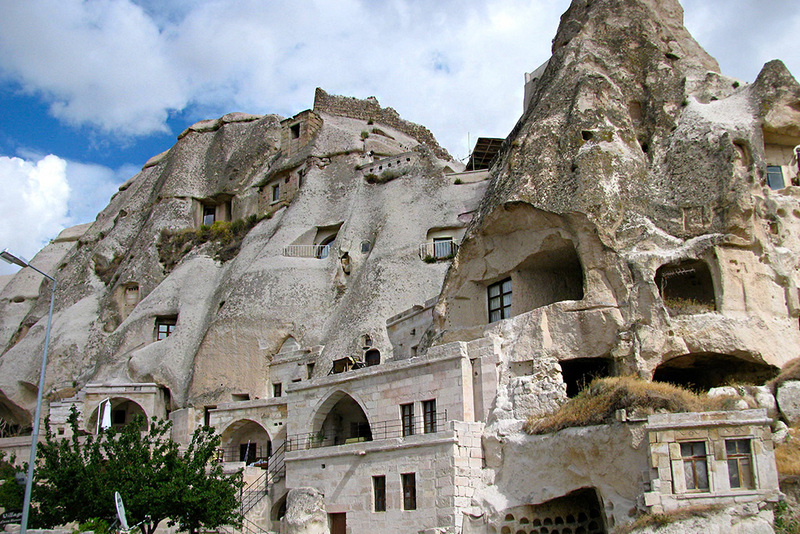 Cappadocia Cave Suites is nestled amid the back roads and fairy chimneys of Goreme, and is just a 2 minute walk distance to the Town’s center, as well as the Goreme Open air museum. The chimneys are synonymous with the region and are a unique part of Cappadocia’s landscape. Some of the hotel’s rooms are located within the chimneys themselves, allowing guests to relive the days of the primitive caveman. The hotel was jointly developed by Turkish-American tour operator, Bora Ozkok, who also manages a number of Cappadocia’s numerous tours, and Hasan Galci, a regional carpet-dealer. The hotel embodies the local vernacular architecture, comprising of a string on stone houses and monolithic caves that have been completely refurbished into ultra-modern and surprisingly luxurious hotel rooms and suites. 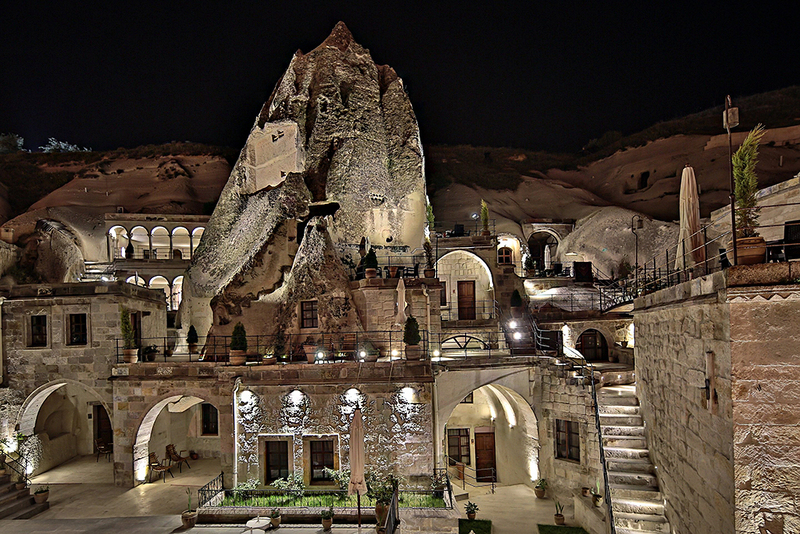 The exterior of the hotel is predominantly rock, which is said to be anywhere from 1500-2000 years old. The original site had included a Christian place of worship, houses, barns and even wineries, and great care was taken to retain its authenticity. Apart from being a landmark destination because of its splendid views of the lovely Goreme Valley, the hotel also preserves the region’s architecture. The interior of the hotel was designed by a famous Turkish architect, Şekibe Aslan, including the lobby, suites and the bar. 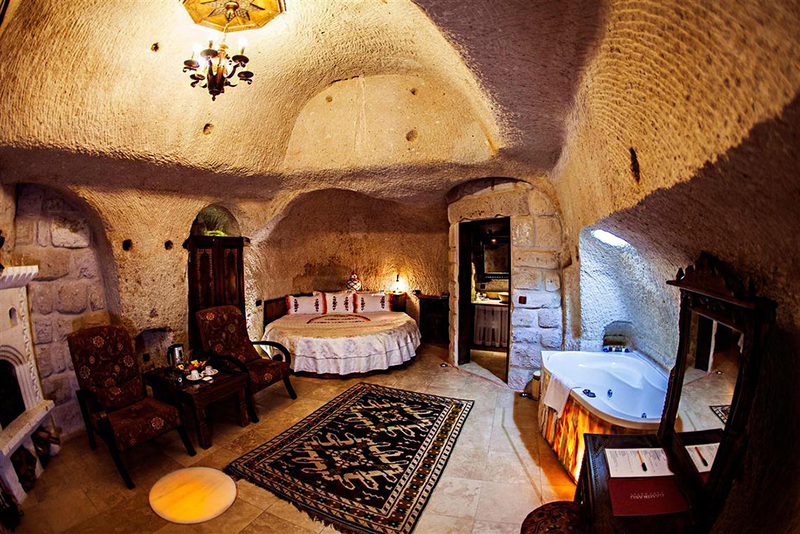 The Cappadocia Cave Suites luxury hotel has lavish guest rooms that feature impeccable Turkish flooring, stone walls, carved out moldings and fireplaces, and cross & barrel -vaulted ceilings. The fittings in all the bathrooms and the in-house spa were provided by Lokum Istanbul, a fashionable Turkish lifestyle company. 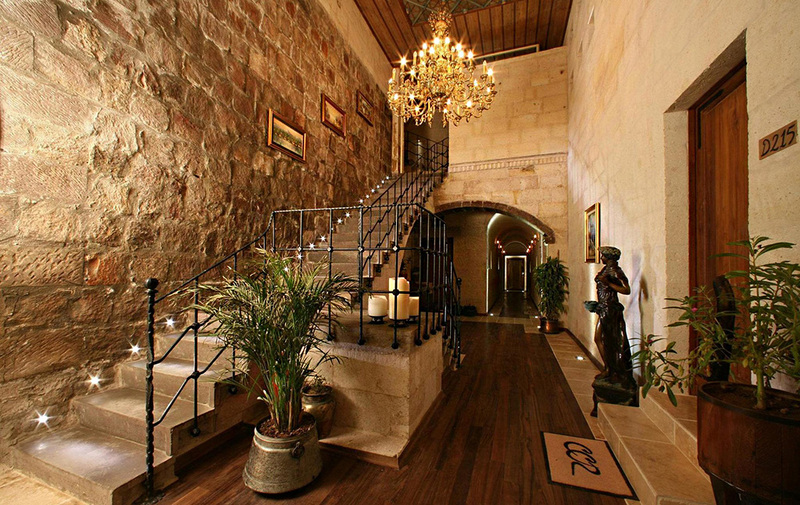 36 guestrooms in all, the rooms at Cappadocia Cave Suites are beautifully crafted from hand carved stone, adding to the unique blend of rock and mortar into the building’s architecture. And since the rooms were hand carved out of the rock, no two rooms are of the same size or layout, as well as the decorations. 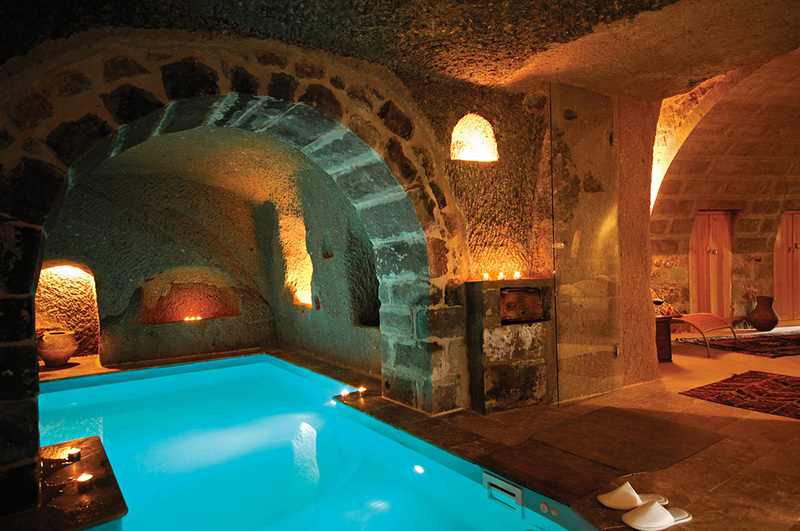 For a hotel that offers its guests such a unique living experience with lavish amenities, the rooms at Cappadocia Cave Suites are fairly priced, offering all of today’s creature comforts and much more. Fairy Chimney Suite I – A total of 7 unique Fairy Chimney Suites that feature a seating area, along with the queen size bed. The suites come with molded fireplaces and are typically large enough to handle extra beds and guests. 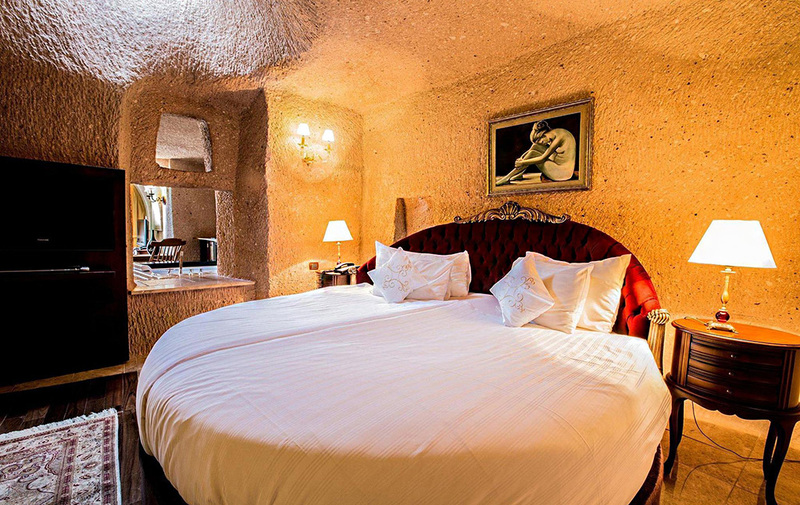 Fairy Chimney Suite II – A total of 7 quarters comprise the second kind of chimney suite at the hotel. These include a mix of carved out rocks, and hand built stone rooms. Cappadocian Deluxe I – A few sizes larger than the regular suites, there are a total of 11 deluxe rooms, which are available either as cave, stone or arch room. 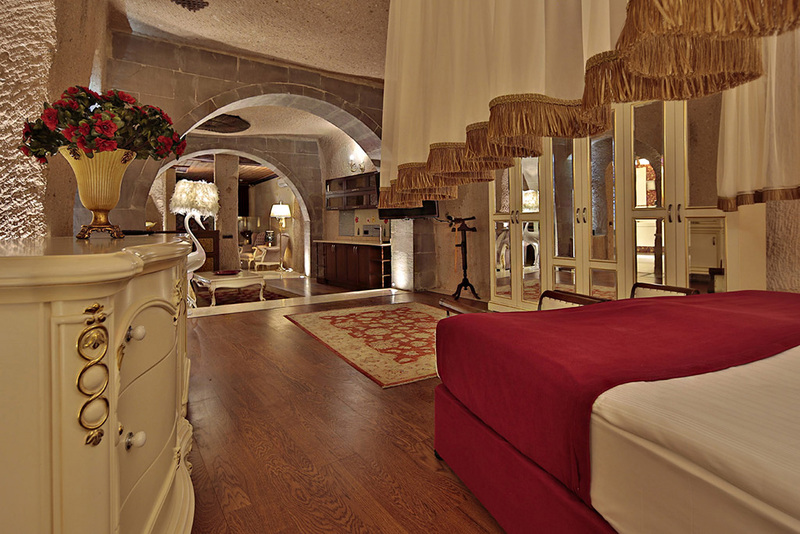 Cappadocian Deluxe II – These deluxe rooms are also larger than the regular suites, and the hotel has 11 rooms of this type. These rooms are also available as cave, stone, or arch rooms. Special amenities in the hotel rooms include safety lockers and a minibar, as well as complimentary high-speed wireless internet. All rooms feature large LCD TVs that play all local & international cable channels. Other small knick-knacks include complimentary newspapers and international calling facilities. The bathrooms are modern and offer a choice between jetted bathtubs or overhead showers. 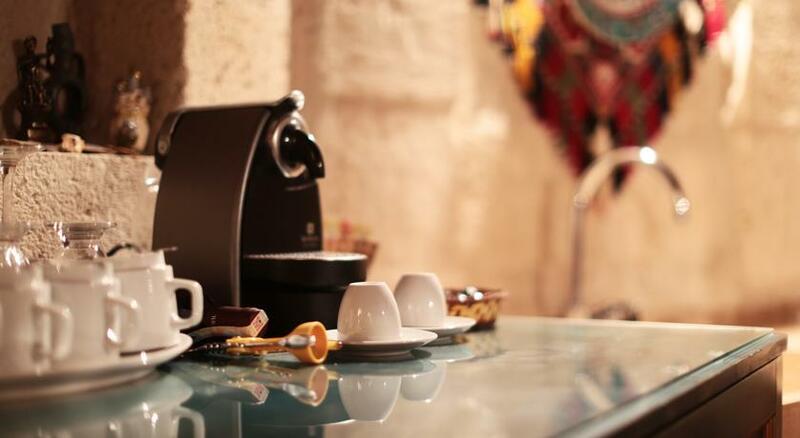 The rooms feature kitchenettes that are equipped with tea & coffee makers. The hotel is a tourist attraction in itself, but its central location on a bluff overlooking Goreme Valley means that you could spend your entire holiday on the hotel room balcony and not miss a thing. For those seeking more than just novel accommodation can take part in any of the numerous sightseeing tours, which are organized based on different themes, for singles, couples and large groups or individuals. Apart from the sightseeing, Cappadocia Cave Suites also organizes their very own Turkish Nights, with mesmerizing dervish shows, delectable meals, and belly dancers. 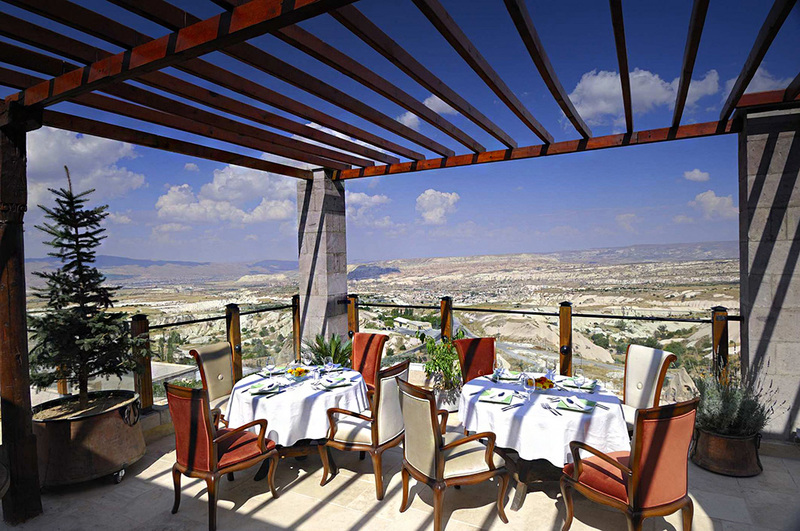 The Sunset Café on the hotel’s terrace offers some of the most breathtaking views of Goreme Valley, and unforgettable sunsets. Spa Therapy – For tourists looking to unwind, the hotel comes with premium amenities, including spa tub, Turkish-style sauna, and a massage parlor. Guests can also pamper themselves with concierge services, and an on-site designer hair salon. The highlight of the spa is its Turkish bath, which begins with a sauna, followed by a hot water rinse and gentle exfoliation. The bath ends with a relaxing soapy massage. Dining – The hotel’s in-house dining options include the Historia Restaurant, a coffee shop, and a bar lounge. The Historia is a little known culinary secret of the region, and the service is surprisingly good. The restaurant is also the hotel’s buffet breakfast service point, and is included as part of the room rate. Dinner buffets and a la carte options are also served in the same restaurant, and while the options might seem a bit limited, the quality more than makes up for it. Hot Air Balloon Ride – For those intrigued by the sight of hot air balloons or just looking to try something new, the hotel arranges for hot air balloon rides on any of the dozens of hot air balloons that go on short rides around Cappadocia. Hot air ballooning is itself a novel experience, but the rides in Cappadocia offer splendid views of the valley below. Going up to heights of up to 1500 ft., just above the rock formations, the hot air balloon experience in Cappadocia is like no other. 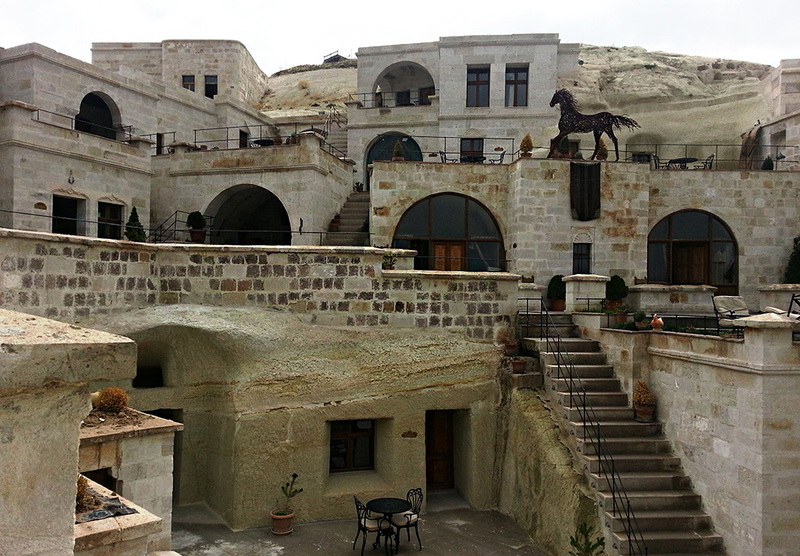 Cappadocia Cave Suite’s central location also ensures guests that they are close to the town’s main attractions, including the “fairy chimneys.” The hotel is within walking distance of other landmarks like El Nazar Church, a Roman Castle, and the Goreme Open Air Museum. The scenic Zemi Valley is a short drive away, as is Also nearby are Zemi Valley and a cross golf course. What this means is that guests can enjoy the best attractions that the region has to offer, without having to waste money and precious time travelling from one sight to another. The Historia Restaurant might seem dingy, but is one of the better eating options around. That being said, the restaurant isn’t always open, and it’s a steep climb to the town below. So anyone with problems in walking or climbing might want to reconsider. The hotel offers airport shuttle services to both Nevsehir and Kayseri Airports. End your evening on the terrace of the hotel’s Sunset Cafe. The suites lack, which might make it difficult to organize and manage clothes. Hot Air Balloon rides cost a bomb on-site, so it is better to book them in advance to save some money.